Join the award-winning daily town walk to discover Stratford and its fascinating relationship with William Shakespeare. See the Shakespeare town houses, theatres, River Avon, 15th century timber-framed buildings and visit Holy Trinity Church. Hear fascinating stories of fires, flooding, plague, old fashioned sayings, medieval cures and history, wrapped up with a little Shakespeare. No need to book, just turn up by the swan fountain on Waterside, opposite Barnaby’s fish & chip shop. Stratford Town Walk and Bancroft Cruisers present an entertaining ghostly evening cruise on the beautiful River Avon. Join the Man in Black or Vincent (Equity members/professional magical entertainers) for a blend of chilling stories enhanced with magic and mind reading, stimulating the imagination. A brief interval during the cruise provides the opportunity to stretch the legs and re-visit the bar. Boarding from 7pm, sailing at 7.30pm. The boat is covered, centrally heated, has toilet facilities and a bar to raise the spirits! Duration approximately 1 ½ hours. Evening cruise on the River Avon followed by a Ghost Walk around ‘haunted’ Stratford. Bancroft Cruisers and Stratford Town Walk have teamed up to organise a special evening of entertainment. The evening starts at the Holiday Inn Hotel where the ‘Rita Ellen’ will be available to board from 6.30pm, sailing at 7pm. The boat is accessible, centrally heated, has toilet facilities and a bar. The relaxing cruise along the gently flowing River Avon with its abundance of wildlife, provides a delightful backdrop to charm the senses. A commentary will be provided during the cruise and a ploughmans platter (courtesy of Havilands). And then things change! 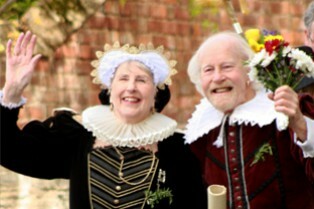 At the end of the cruise, a costumed guide from Stratford Town Ghost Walk will arrive for the magical ghost walk. Discover the ancient buildings and hear tales of ghosts, witches, murder and misery, with a little magic. The evening will end at around 9pm at the Swan Fountain on Waterside. The walk is easy going, but warm clothing and sensible footwear are recommended. Highly acclaimed evening Ghost Walk in ‘haunted’ Stratford. Join a costumed guide for an entertaining evening of ghostly stories, with magic or spells. The guides are members of Equity and professional magicians or entertainers. Walk starts at the swan fountain on Waterside, opposite Barnaby’s fish & chip shop.